Our living room is getting a refresh! Since our renovation, almost three years ago, our living room has barely been used. Although I love the bones of this room, I didn’t put much thought into the use of this space, nor did I invest in any proper furniture. If you’re following my progress on Insta Stories, I’m trying to make this space a little more practical for both everyday living and entertaining. The first thing I’m addressing is the lack of seating. Currently we have two club chairs in this space. Adding a sofa to our existing layout would be beneficial in so many ways. Since the living room is the first space you see when you walk through our front door, I had two requirements. ONE. It has to look stylish; and TWO. Comfort is a must! Meet the Kits Cascadia Blue Sofa. This velvety blue goodness is from Article, an online-only retailer of modern furniture. What I found intriguing about this Company is there’s no showrooms, no sales people, no middleman, which helps make their pricing very competitive. I was beyond excited to partner up with them to make my living room dreams come true. So, are you curious on how a single push of a button, no heavy lifting, mail-order sofa works? Here’s my personal experience. Shipping is a breeze. Delivery fees for any large item on Article’s site is just $49, and there’s no additional duties or taxes to be paid at the door. The delivery team schedules a date and time that works for you. The sofa arrives in a giant box, and if you opted for the inside room + assembly service as I did (Article has three delivery options at different price points) they’ll remove your new furniture from its packaging and set it up where you’d like in your space. I will admit, at first, I was kind of skeptical of the quality and thought “I hope this isn’t going to be one of those low-grade sofas”. You know, the ones that you have no problem lifting with one arm to get the vacuum cleaner underneath. After all, I did order a sofa off the Internet, right!? WRONG. All I got to say is this ain’t no budget quality. It’s a legit heavy duty-sofa, (which for your information, cannot be moved solo). But judging the quality of a sofa goes much deeper than its appearance and weight. One of the most important aspects to look at is how the frame is constructed. The best frame is made out of kiln-dried solid wood, which this particular sofa is made out of. The process of kiln drying removes all moisture from the wood, enabling it to retain its shape and stability over a long period of time. The brass cubic base and blue velvet combo gives off a luxurious feel and the 42″ depth makes this the perfect lounging sofa. 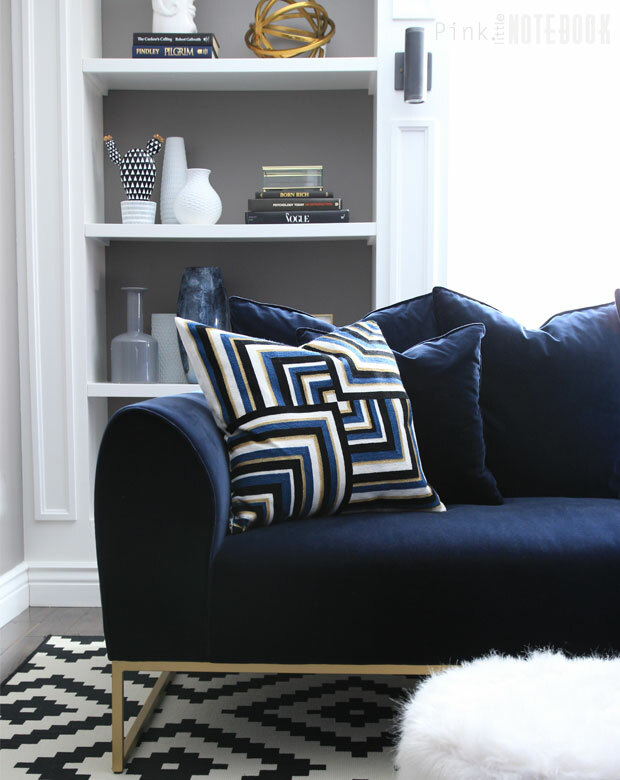 The blue velvet cushions (six to be exact) are all included with this item. These are not attached to the sofa and can be arranged to your preference. I absolutely love the fact that I’m able to put my feet up and curl into a corner with a book. Article does provide a 30-day return period if you’re not completely satisfied with your purchase. Just an extra piece of mind especially when it comes to larger pieces for your home. Overall, I’m quite happy with my newest addition for our living room. It’s a great start and I can’t wait to finish this space off with a few other items. Be sure to follow me on Instagram for updates! Disclosure: This post was done in partnership with Article. As always, this post reflects my honest thoughts and opinions. I’m absolutely loving the sofa that you picked for your living room! 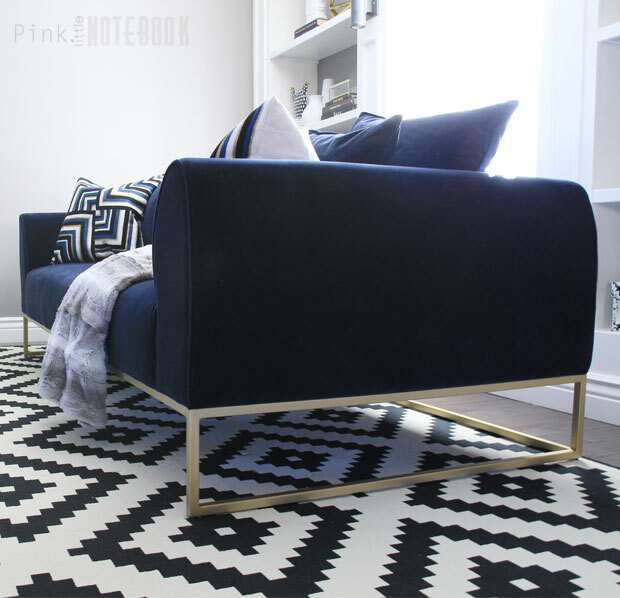 The colour and gold accents on the bottom really compliment the room and tie into your décor. Amazing choice!! Thanks so much Emily! We are really pleased with our new addition! I love the look of the living room now with the addition of the couch. I need to plan what I want our living room to look like. It is full of mismatched furniture that was given to us. Right! That’s usually what happens and then you end up never using the space. We are trying to make the most of this small space! Omg I am obsessed !! 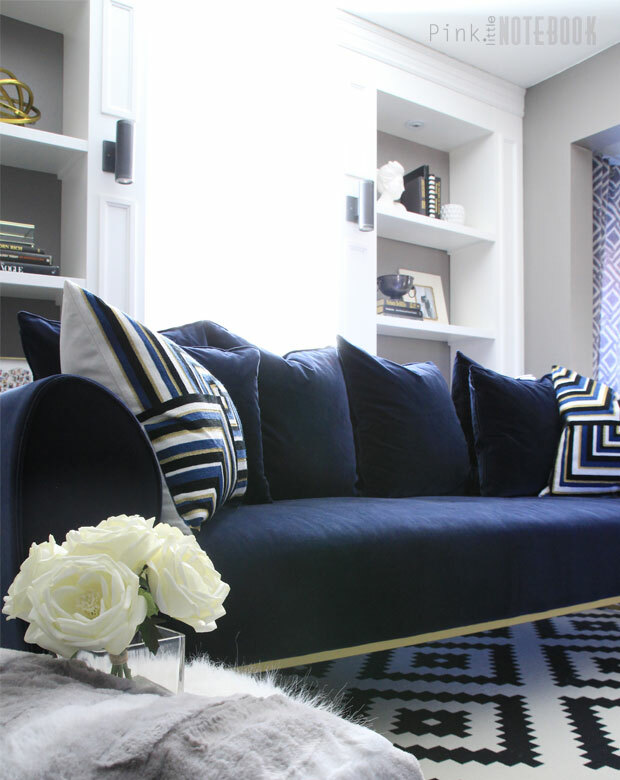 LOVE the sofa and that rug just brings it all together!! This is a gorgeous couch – love the color and the detailing on the bottom. Love the bright whites, too! The gold accent is my fave! Thanks so much! What a transformation! I love that dark blue couch! Thank you Amanda! We love our newest addition! This is fabulous! What a fantastic piece that looks amazing in the room. Love how luxurious and still comfy it looks! It’s my favourite place to curl up and read a book! Thanks Patricia! The makeover looks great. It’s amazing how just making a few small changes can make a big difference in the feel of a room. Definitely agree with you! A little pop of colour makes all the difference! Wow! That’s a nice sofa to have. It’s so modern and I feel like that’s perfect for an apartment in a city. OMG!! This is gorgeous!! Love your space and decor!! That sofa is amazingly gorgeous. The color of the sofa is just stunning! I absolutely love your space – it looks like the perfect area to relax and entertain. Really great decor and the colors are perfect! A stunning sofa is essential in home staging. Good example. Sofa is looking gorgeous and also nice setup. Blue is beautiful!! Also, that rug below has increased its opulence. I also have a blue sofa. 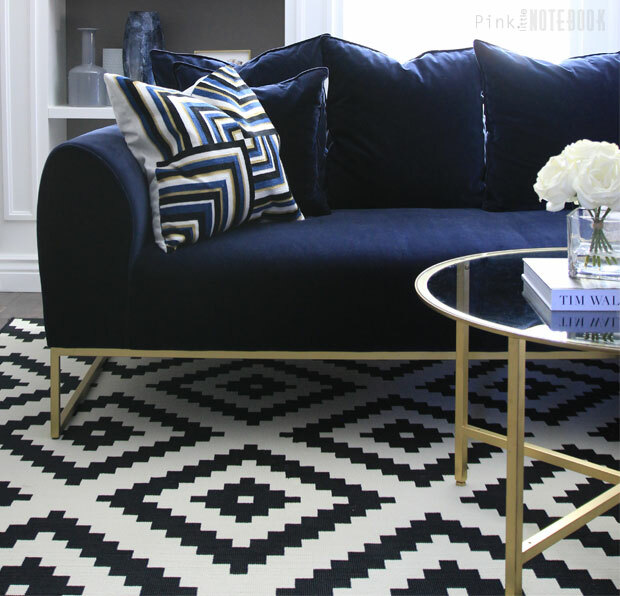 can you suggest from where you purchased those rugs? I think it would be a perfect fit for my blue sofa also. Looking forward to hear form you. Hi Akshay, the rug is from IKEA. This is indeed an amazing transformation. I really liked this living room makeover. I just love the sofa. Thanks a lot for sharing this post. loving the information and also having some great tips thanks mate. sofa also look very attractive. I wish I could have yours sofa!